The expansion of fishing activities in the ocean has contributed to the decline of some sea turtle populations. 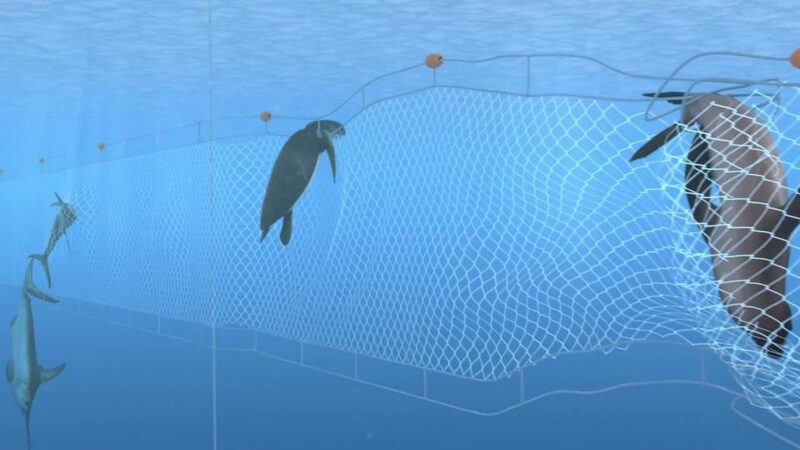 Sea turtles, among other creatures, can become entangled in gillnets (see video here), pound nets, purse seines (see video here) the lines associated with longline fishing (see video here) as well as traps and pots (see video here). Entangled turtles often drown or suffer from injuries such as abrasion or limb loss by being constricted by fishing lines. Indirect effects may include reduced ability to avoid predators and decrease in forage efficiency. 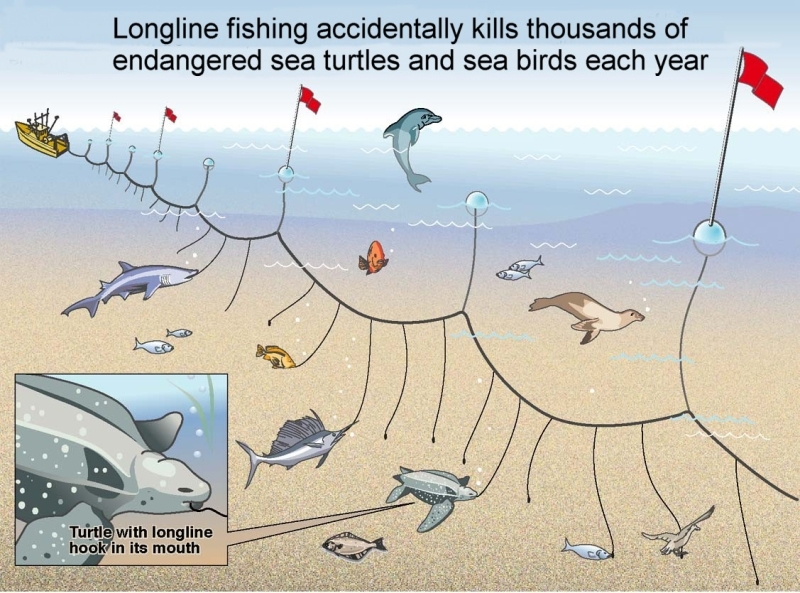 Longline gear can also hook turtles in the jaw, esophagus or flippers. Trawls without turtle excluder devices (TEDs) do not allow turtles to escape, which may result in mortality through drowning. Fishing dredges, which are extremely heavy metal frames dragged along the ocean floor, can crush and entrap turtles, causing death and serious injury. In Okinawa, the main cause of death for sea turtles is fishery bycatch. Sea turtles are often entangled in fishing gear and prevented from surfacing to breath, which causes them to drown. 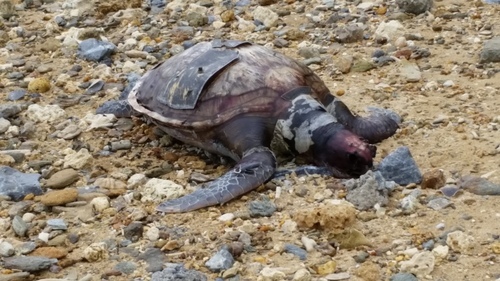 The image below is a green sea turtle found dead on Tancha beach, Onna-son, after necropsy conducted by the Churaumi aquarium revealed that the cause of death drowning most likely due to fishing gear entanglement. 1. Modifications to fishing gear and fishing methods, including using circular hooks instead of “J” hooks for longline fishing and using Turtle Excluder Devices in trawl nets. 2. Post-capture practices that can improve the survival prospects of sea turtles after release. 3. Area or seasonal restrictions on fishing operations. 4. Voluntary communication between the fishing fleet to avoid sea turtle hotspots. 5. Controlling the type or amount of fishing (input controls). 6. Limiting the catch through total allowable catch (TAC) or quotas (output controls). 7. Imposition of a bycatch fee or other compensatory methods. 8. Avoiding the loss and discarding of fishing gear and other debris. 9. Retrieving disused fishing gear and other debris at sea. If interested in learning more about this subject, please refer to Guidelines to reduce sea turtle mortality in fishing operations, published by the FAO. Sea Turtle Art Show: Great Collaboration and A Great Success!